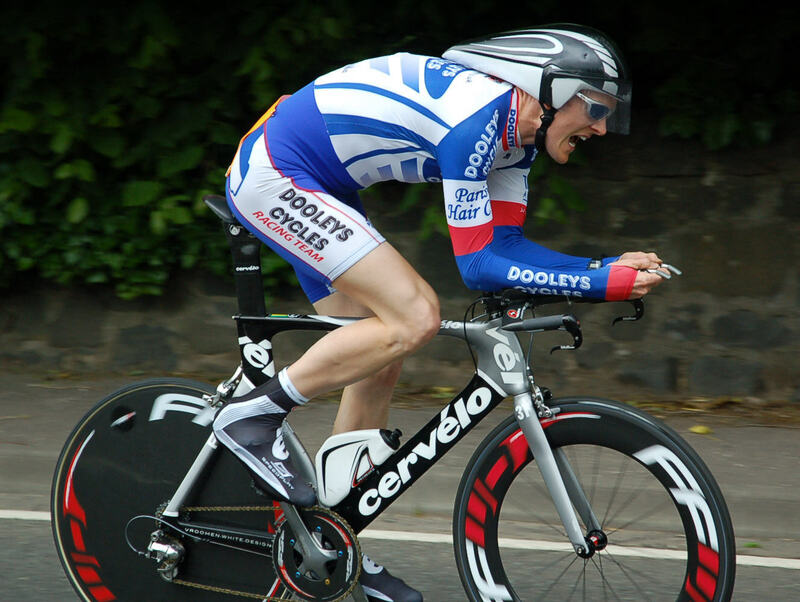 Arthur Doyle, (Dooleys) comfortably retained his Scottish 25 Mile Time Trial Championship 2010 title with 52:54 on a cool but mostly dry Sunday morning around the verdant Howe of Fife, second was the man on the big fixed gear who was the surprise of the 2009 ten mile champs, Peter Ettles (Sandy Wallace Cycles) with 54:07 — surprise this time was Philip Kelman (Deeside) with 54:44 off an early number 45 start. VeloVeritas didn’t arrive until number 92 was on the line, so apologies to Mr. Kelman for the lack of photographic evidence. 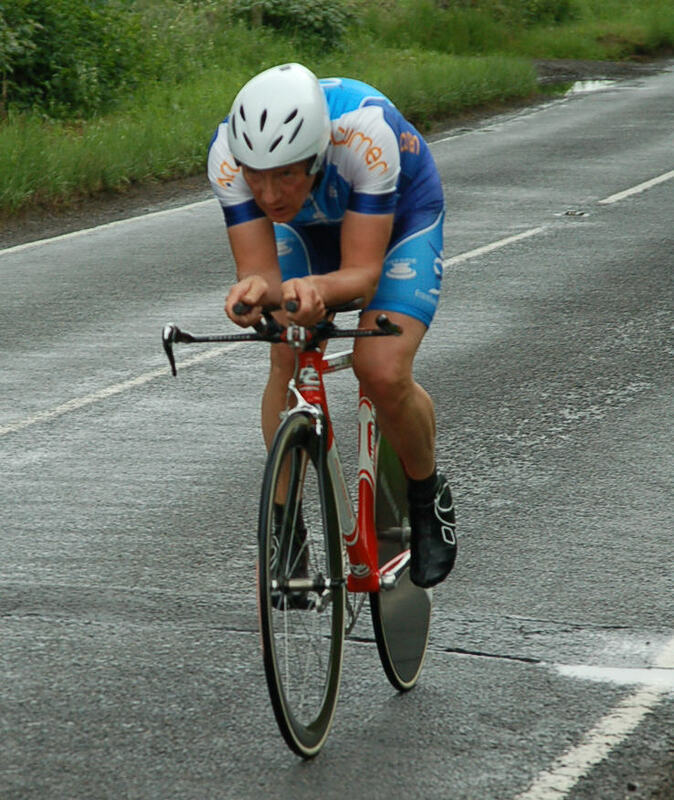 We didn’t head on to the ‘Windy Mile’ which comes off the descent and used to make such a tough finish for Fife time trials, but instead hung a left in to picturesque Freuchie to collect a start sheet. That’s our last organisational moan, this was a well promoted event — to go off course would have been nigh impossible, with good signage and more than enough marshals. After the windy mile there’s the drag up through Ladybank Woods before the rolling section to Melville Lodges roundabout — but the lodges have long gone. ‘When I were lad,’ the Fife 25 course turned left here to dead turn near Strathmiglo then retrace to Bow of Fife via Melville before turning left to finish at the end of the Windy Mile — it was fast on the right night; John McMillan’s 55 from the late 60’s stood as Scottish Record for many years. Nowadays the riders head north to Parbroath cross roads where they turn left towards Lindores. 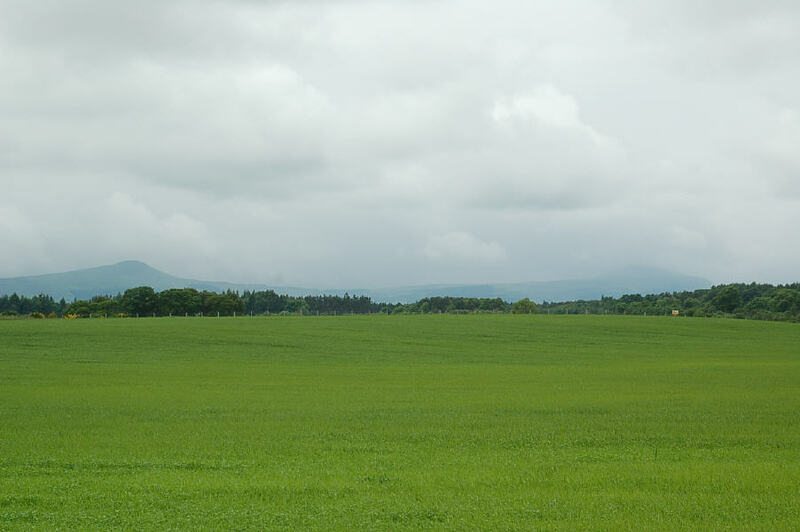 The drag to Lindores village was where we chose to take our first pics; there was a cool westerly breeze and some fine rain — Ian Humphreys (Deeside) was our first caller, looking neat on 87” fixed. Ian Humphreys, neat on 87 inches. We missed a shot of ever-green Davie Millar (Glasgow Couriers) and his ‘semi-superman’ position; it’s a good job there are no UCI technical guys here, they’d go into spasm. 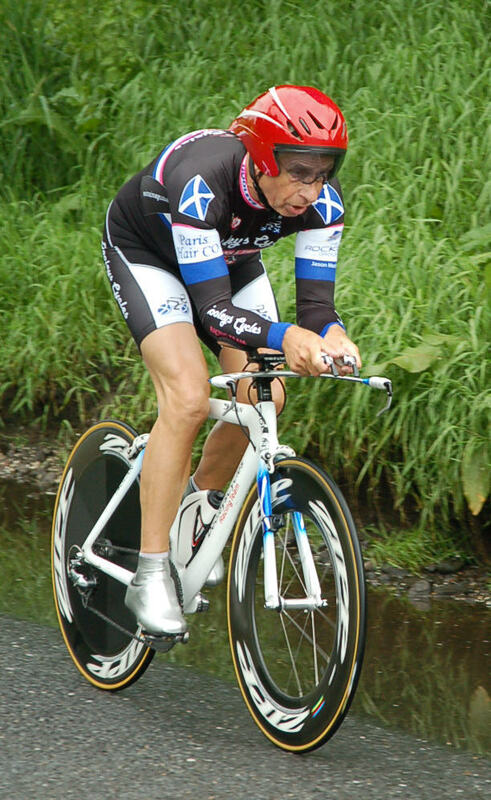 Steve Nutley (Fife Cycling 2000) looked the part on an ‘over drive’ gear and reminded us a wee bit of Bert Roesems. Off 105 and looking like he knew what he was doing was junior star from way back, Jeremy Greengrass (Vortex RT) – but when we left our spot to head further round the course, he was stopped at his dad’s car just around the corner; ‘I imploded and left me breakfast on the road!’ he explained. Tall Alistair Robinson (Leslie Bike Shop) took the bronze in the 10 champs but despite his impeccable style, there was no cigar, today. Alistair Robinson will certainly be up for this encounter. 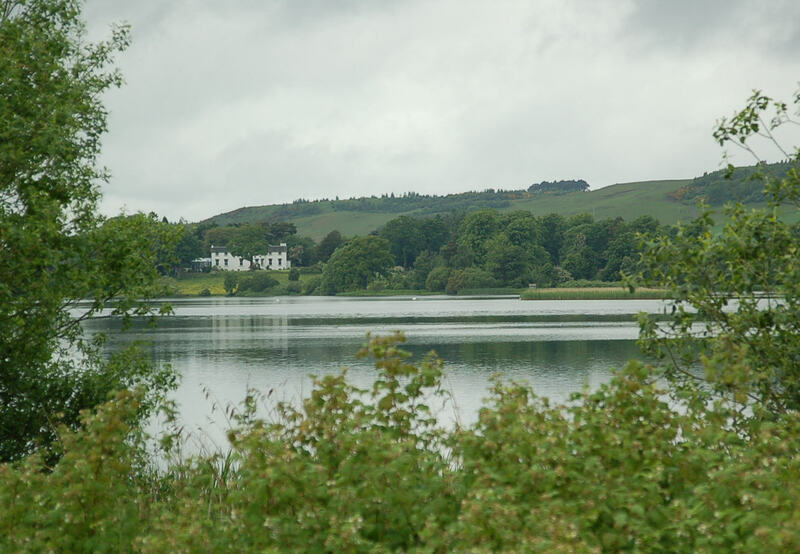 Next stop was beautiful Lindores Loch, where the nutters drive their cars around when it freezes. Bob Taylor was on his usual ‘biggie’ but looking the part. 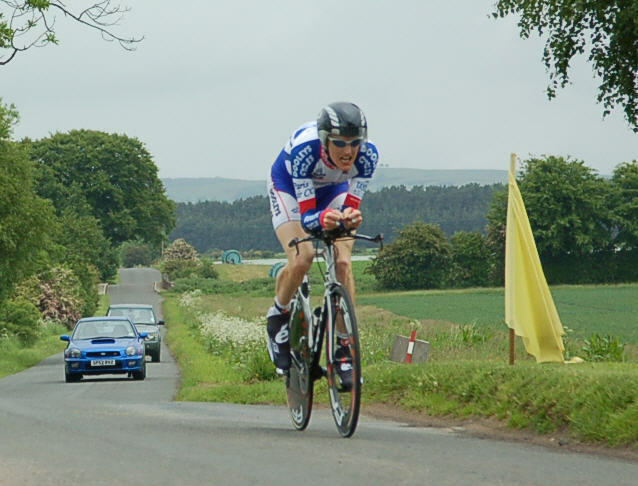 Lindores is the high point of the course, the road drops to Collessie cross roads where the riders turn left to arrive back at Melville lodges, where Mark McKay was stationed — didn’t see you at the road race yesterday, Mark. Straight over towards Cupar but turn left at Bow of Fife; back in the 80’s our buddy, Jimmy Grieve liked this wee road so much that we named it ‘Grieve’s Dreel’ the views over to the Lomond Hills – or the ‘Paps o’ Fife as the mariners call them — is wonderful. Left, back to Melville and all the way round to head back west to Collessie and that left hander that leads into the last three miles of pain. Collessie is a good spot for race-spotting, with the top seeds dropping down from Lindores and the earlier starters coming in the opposite direction and hanging the left for the finish. 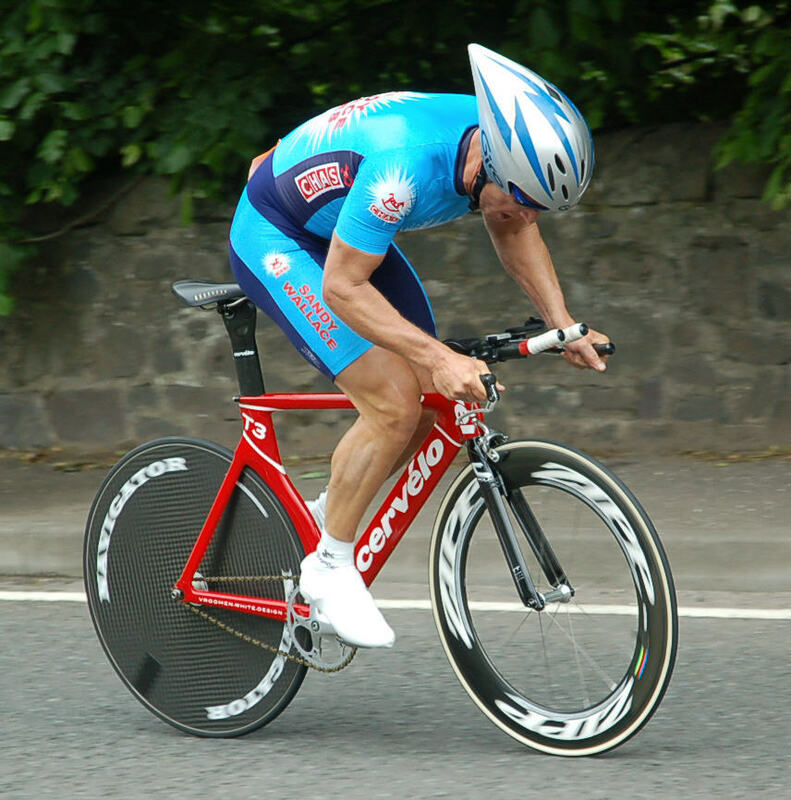 Peter Ettles was moving visibly faster than anyone we’d seen all morning as he kicked that Cervelo out of the bend and headed for Melville like a scalded cat. 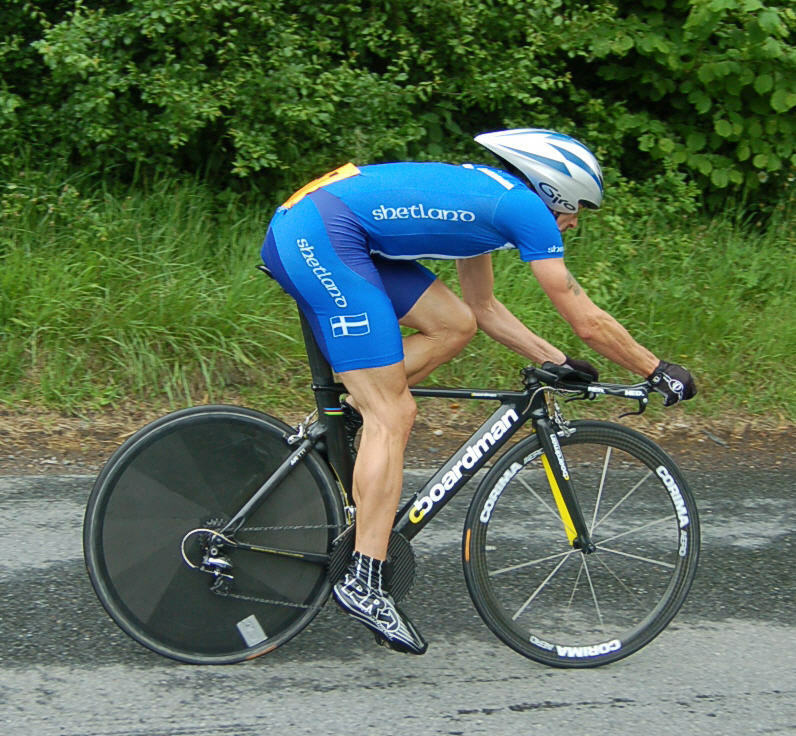 Peter Ettles accelerates out of the Collessie turn. Ian Black (Sandy Wallace) isn’t a man for that low gear stuff, but with all the twists and turns on this course, it’s not ideal for him, losing time out of every corner and looking slow compared to the sharp Ettles. Carlos was his usual big-geared smooth-self and not bad for exit speed on the corner. That rare image – a Carlos gear change. No Jonathan Copp, either — I did consider a ‘not much Copp’ pun, but thought better of it. Arthur next, hurting but on top of it, accelerating hard in to the drag up to Melville. Arturo hurts out of Collessie. Peter hurtled in from the east, telling us later that his entry speed was a wee bit high for those slick Vittoria Pistas, he was full of riding and accelerated hard out of the corner. Peter Ettles on them slippy track tubs. It was a long wait for Ian and the air was getting cooler again as he eventually eased round the corner, nearly two minutes shy of Peter’s time. Carlos was a minute up on Ian but a minute down on Peter. Arthur was really trying and it showed – but it does hurt when you go at big speeds. I grabbed a shot of him from the car as he hurtled through Giffordtown towards the right hander which leads into the last mile and Shiels triangle. At the 200 to go flag he was on his knees, but that’s how you’re meant to finish a test. “I cramped up at Collessie, that’s the first time I’ve had cramp in years, I think I put too much into the drag to Lindores. “The plan was to take the first part relatively easy — which I did, top gear was spinning nicely with the tail wind – then ride the dragging section to Lindores really hard and still have a bit left for the drags on the run-in. 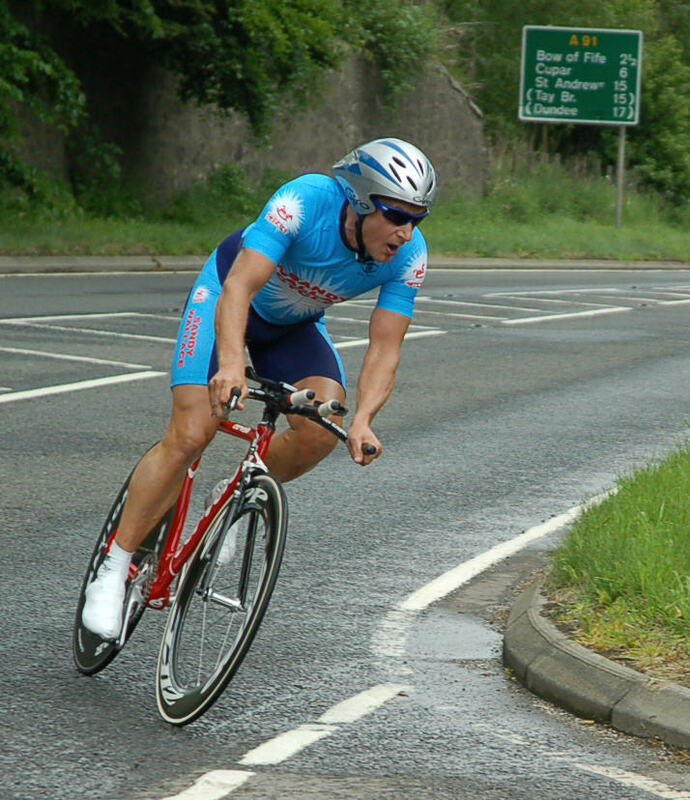 “I was familiar with the main road sections of the course — I sometimes do a commute from my home in Dunfermline to Saint Andrews on the bike – but not the back roads; I haven’t had time to explore the little lanes, although I did check it out on the map. “I’ve had the NORO (winter vomiting) virus four times in the last 18 months — it’s one of the hazards of working in a hospital. “No, I won’t be riding the 50, I’m in Germany at that time but I will be riding the British Masters’ Pursuit. “Training-wise I’ve started to do 20 minutes at just above my lactic threshold every morning, even if I’m doing a commute ride; it seems to have made a difference and helps keep my weight down. “I was on 103, if you go any lower you’ll just spin out – all the guys you’re riding against are travelling at 30 mph, after all. 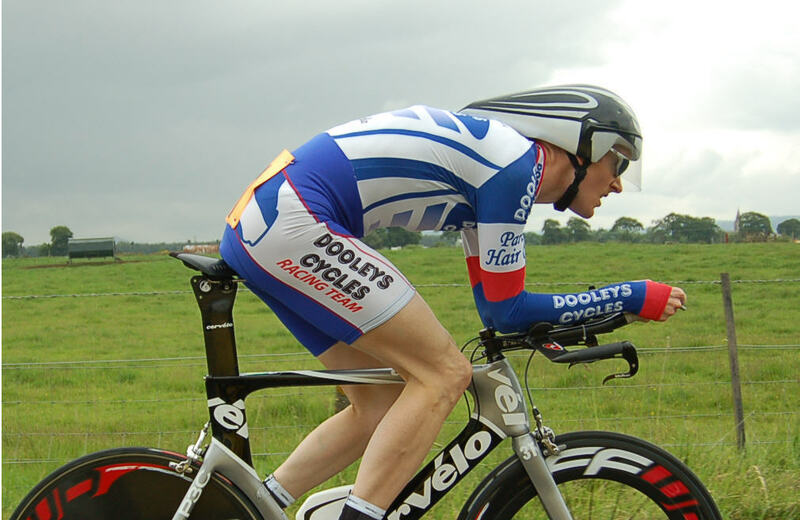 “I do all the road training but now I’ve shortened my turbo training down towards the pursuit. “I’ll need to get down to Meadowbank and do some track work, though. “I have the British champs coming up in two weeks then the Europeans – and the Worlds are in Portugal in October. We left before the presentation — these words don’t type themselves and of course the pictures need edited. See you at the 50 champs? 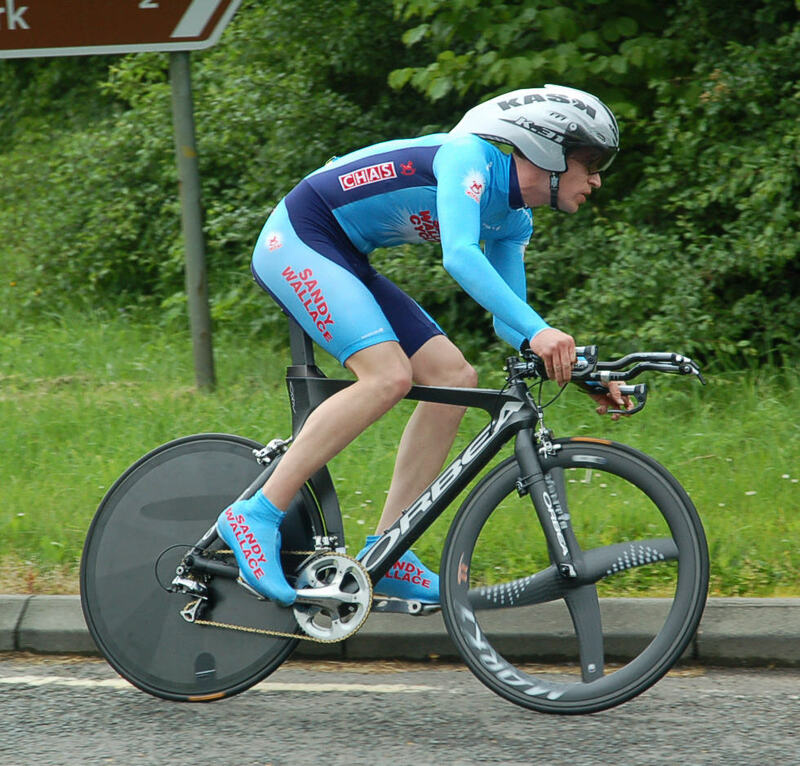 Previous articleThe Scottish Road Race Championship 2010 – Endura Whitewash!